In a 24 hour period, Sen. Barack Obama has started to sound presidential and Sen. Hillary Clinton’s message is getting lost in the weeds. Take a look at just a few minutes of Obama’s speech from North Carolina and you’ll see what I mean. If you’re the presumptive nominee, you should be talking like this guy. If this is our Democratic nominee (and I have said in this space for a long time that I think he is) the question now becomes, how did Hillary fall so hard? As we so often do here at thinkmatter, let’s look at her messaging. Peter S. Canellos of the Boston Globe yesterday had picked up exactly the line that the Clinton campaign had been hoping every reporter would. Specifically, a softer, less opportunistic and distinctly blue collar Hillary who understands the needs of everyday people. “Few politicians in American history have carried less of a reputation for “Cheers”-like camaraderie than the senator from New York, who was widely seen as cold and calculating. But that stereotype has been cast aside by many voters, replaced by its positive twin: The same steely-eyed characteristics that made Clinton seem cold now make her seem purposeful; what was once seen as calculation is now determination. This is an unprecedented success for a candidate, and an especially unusual one for a candidate like Hillary, whose past reputation has been weighed down by perceptions that she’s an…ahem, ‘rhymes with rich’. Had this cream-puff story carried any water into the May 6th contests, she would have gotten a pass for the last few months she has spent essentially asking for the most unprecedented thing in American political history – crown her the nominee based on her own projection that she could be a better candidate against McCain. Ignore the numbers and vote tallies, she’s saying, and make me your nominee because I might have a better shot at winning in November. “Very early this morning, after many voters had already gone to sleep, the conventional wisdom of the elite political pundit class that resides on television shifted hard, and possibly irretrievably, against Senator Hillary Clinton’s continued viability as a presidential candidate. 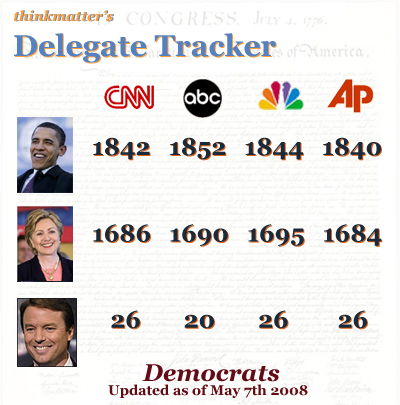 The moment came shortly after midnight Eastern time, captured in a devastatingly declarative statement from Tim Russert of NBC News: “We now know who the Democratic nominee’s going to be, and no one’s going to dispute it,” he said on MSNBC. “Those closest to her will give her a hard-headed analysis, and if they lay it all out, they’ll say: ‘What is the rationale? What do we say to the undeclared super delegates tomorrow? Why do we tell them you’re staying in the race?’ And tonight, there’s no good answer for that.” Jim Rutenberg writes in today’s New York Times. I understand the strength of her logic before Indiana/North Carolina. For many voters casting their ballots in a primary season, the ‘electability’ question is often taken into account when voting for a candidate. But after her showing in these primaries, it will be a Sisyphean effort to convince entire groups of electors (namely superdelegates and the Democratic Party establishment) to take this into account over and above the will of the voters. Her arguments are now seen for the absurdity with which they were formulated. She has no measurable numbers on her side and now that she took such a huge hit in North Carolina, it would be difficult for her to achieve any viability from here on out. Now, she says that she will fight until there is a nominee. If you will permit me just one last thought before the unveiling of the Delegate and Superdelegate tracker. How long do we think the Republicans won’t latch themselves on to the following storyline: “The political ambitions of a few people are now superseding the interests of many Americans. Democrats aren’t bickering about policies, they are simply bickering about ambition. It’s not about becoming president, it’s about what you want to do when you are president. Sen. McCain is going around the country touting his plans to solve real problems for real Americans, and Sen. Obama and Sen. Clinton are simply trying to outwit and outflank each other just for the sake of a seat in the Oval Office. The Democrats arent’ talking about real issues.” Commence launch of potential GOP talking points. Staying in this race hurts her and it hurts Sen. Obama. Let’s see what she does after the last primary in June. The smart money might be on her striking a deal to become V.P. prior to the Puerto Rico Primary. Of course, the even smarter money might be on Obama marginalizing her by addressing only Senator McCain in his speeches and letting the press hammer her into dropping out. All speculation aside, if we see anything at all in the next few weeks, it’s going to be Hillary scrambling. 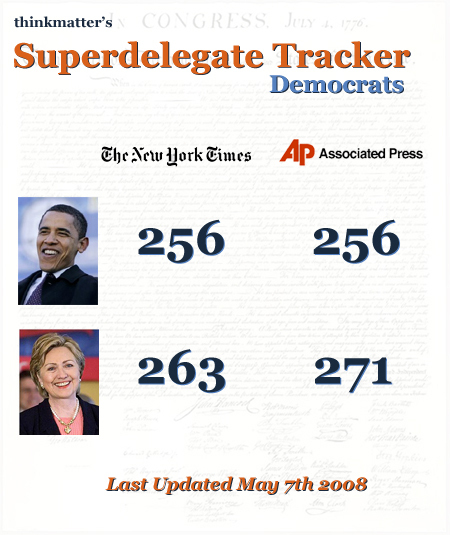 And now, the long awaited Delegate and Superdelegate Trackers. She didnt run a good camapign. The Super Tuesday strategy didnt work, and Team Clinton seemingly didnt know what to do after that.